nix alley: My Timex Ironman leaked!! Had a nice dip in the Arabian sea and when I was walking back to the shore I glanced at my trusty Ironman timex .. The screen was blank !!!. I couldn't believe it . Back home I opened the back cover and discovered that the o-ring was slightly misaligned . I took one strap off , took the machine out of its casing , cleaned the inner casing , placed the machine back , aligned the o-ring , screwed the back cover on to the casing and attached the strap to the casing . 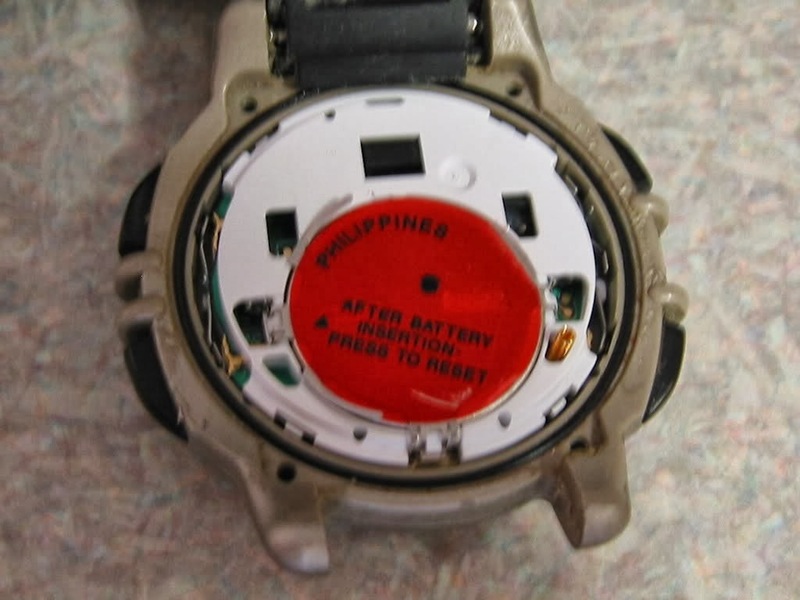 You will need a precision kit ( small screwdrivers) to service this watch. 1) take one strap off : carefully press the pin release with a screwdriver and slide the pin out of the groove. Gently pull the strap in one direction . 4) close the back cover and tighten alternate (opposite) screws . The battery can be easily replaced by unhooking the battery cover gently from its plastic hooks using a pin . The case once opened needs to be very carefully reassembled to avoid losing the water resist. Silicone sealant is recommended but I didn't have any so I sealed it just by cleaning the rubber o-ring .